The digital camo LensCoat for the Sony 70-200mm f/2.8 GM OSS Lens wraps the lens in a 100% closed-cell waterproof neoprene jacket, offering protection from wet weather, bumps, jars and nicks. This coat allows your lens to blend in with your surroundings, making it a valuable accessory for nature and outdoor photographers and helping to camouflage your lens from wildlife. It is also useful for sports shooters and photojournalists who are regularly subjected to less than optimal shooting and climate conditions. It has a clear plastic window over the distance scale. The LensCoat Lens Cover provides a thermal barrier, protecting your hands from cold lens surfaces in lower temperatures. It is easy to install and remove, leaving no residue on the lens. Because of the increased protection this covering provides, it can help preserve the resale value of your lens. Digital camo is an advanced computer generated camouflage pattern which is a pixelated pattern to maximize visual break up. The pattern features small rectangles of color, and mimics naturally occurring dappled textures and rough boundaries. 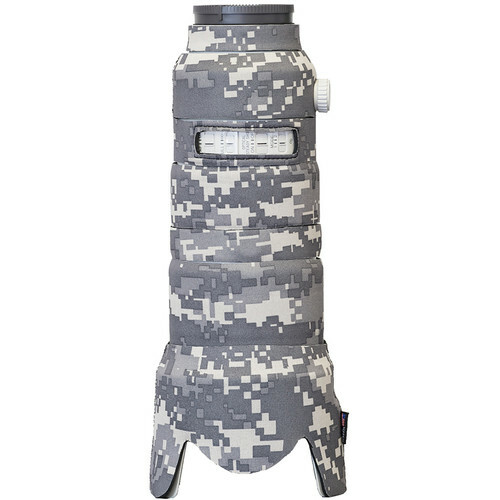 Box Dimensions (LxWxH) 5.9 x 5.6 x 1.2"
LensCoat for the Sony 70-200mm f/2.8 GM OSS Lens (Digital Camo) is rated 1.0 out of 5 by 1. Rated 1 out of 5 by Ken from I would not buy this product again My main gripe with this is that it covers/blocks all the button/switch functions on the lens. If you are one that leaves all lens settings set at one position and never change them, and you do not use the focus buttons on the front of the lens, then this may not bother you. Yes, it insulates the lens from your fingers in cold weather, but I'd rather feel the solid cold lens and have immediate access to my lens buttons/switches. A better option for me may be to use Camo Tape only on the white parts of the lens rather than covering the whole dadgum lens and all the lens functionality that I paid for.